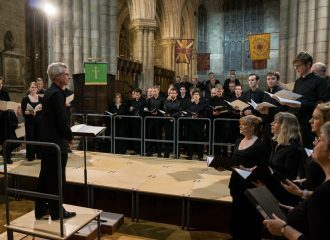 Founded in 1980 by Alan Tavener, the choir has continued to flourish under his leadership ever since and we pride ourselves on the quality of our performances and the range of music that we perform. As one of the longest established amateur choirs in Glasgow, we have an exciting and varied repertoire, including frequent new commissions. Find out if we are performing near you! Our enthusiasm for singing has allowed us to grow and create a wonderfully rich and varied sound. If you are searching for something new or different to listen to, you’ve come to the right place! As a choir with a harmonious but diverse blend of singers, we welcome singers from all walks of life. 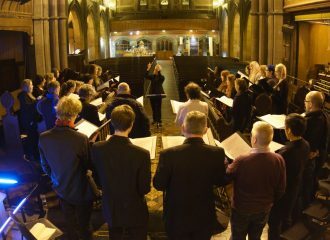 Students from Strathclyde University, Alumni, Staff and equally, singers with no connection to the University are welcome to join our enthusiastic choir. Our choir has an enviable track record, and a diverse repertoire. In addition to our own concert programme, we are a regular fixture in the Glasgow West-End Festival every year. 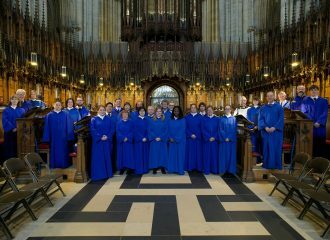 We have sung for weddings, corporate events - and we even act as astand-in choir during our annual residence at a Cathedral (most recently we have sung in York Minster, Ripon Cathedral, Durham Cathedral, and both Liverpool Cathedrals). We tour well beyond the Scottish mainland - having visited Orkney, Spain, Germany, Poland, Russia, and the Middle East. We have also broadcast live, and recorded for BBC Radio 2, BBC Radio 3, and BBC Radio 4.